The downside of being self-employed is that there aren’t any office holiday parties to go to. Not that I went to my office party last year… I had gone the year before and was bored out of my mind. To be fair, most of the people who I worked with were much older than I was, so I only had a couple of friends there that I could chat with. The food didn’t impress me either. There were some generic spring rolls, a few chicken satay skewers and trays of sickeningly sweet desserts. The food at convention centres can be truly awful sometimes. Generally speaking, I love appetizers. It’s more fun to nibble on a variety of flavourful bites than it is to sit and eat a formal dinner. I usually go for one-bite treats like meatballs or little phyllo pastries, but I also love a good crostini! 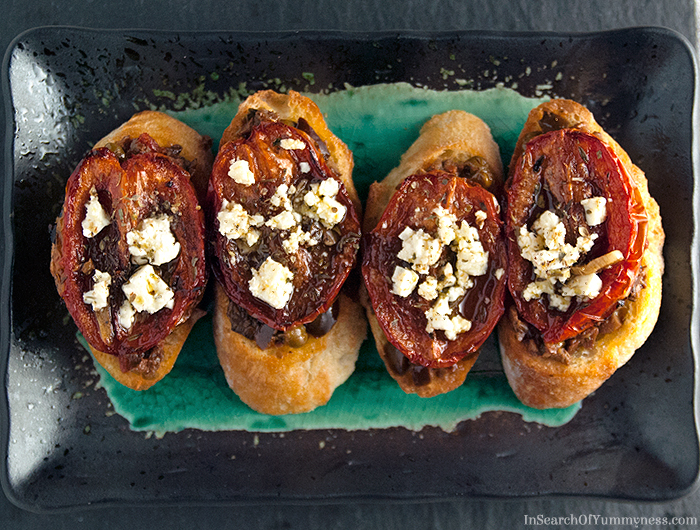 This roasted tomato crostini recipe took a while for me to put together. I knew that I wanted tomatoes, feta and oregano, but I couldn’t figure out what to spread on the toast. Cream cheese seemed too heavy and olive oil wasn’t heavy enough. After puttering around my kitchen for a while, I eventually found a neglected bottle of black olive tapenade. Perfect! The stars of these crostini are Caramelized Plum Tomatoes, which are not my invention. The recipe for the tomatoes comes from one of my favourite cookbooks: Fast, Fresh & Green by Susie Middleton. If you’ve been following my blog for a while, you might recognize that name. I shared Susie’s Vanilla & Cardamom Glazed Acorn Squash recipe last year (with permission), and I’ve reviewed her newest cookbook too. Susie has graciously allowed me to share one of her recipes again, and I know that you won’t be disappointed. If you love these tomatoes, you will love her other recipes too. Please check out her line of books! Brush the baguette slice with oil, and season with salt and pepper. Bake for 5 minutes, or until toasted. Remove the toasts from the oven and allow to cool slightly. 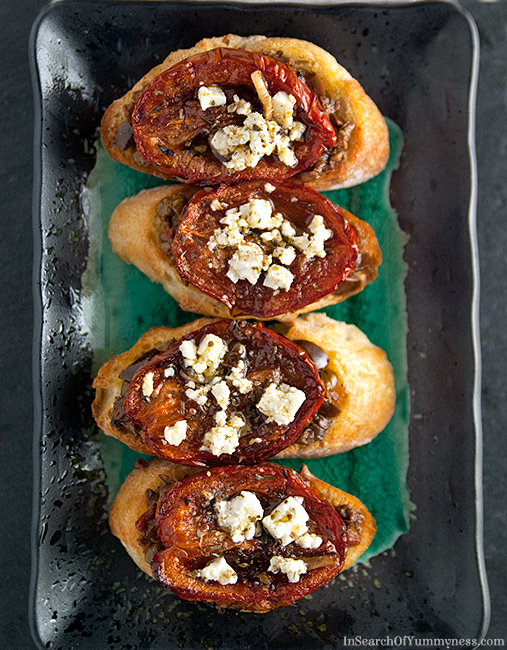 Top the toasts with about 1 tsp of tapenade (you don't have to be exact), 1 tomato half, some crumbled feta and a pinch of oregano. Serve immediately, as the crostini will become soggy if they sit for too long. Make sure to tip the oil out of the tomatoes before putting them on the crostini, or you will leave your guests with a greasy mess! I used the residual oil from the Caramelized Plum Tomatoes for this recipe, but you can use regular olive oil if you wish. Cut each tomato in half length wise, and, leaving in the core, scrape out the seeds and ribs with a tomato shark or a serrated spoon. Brush 1 tablespoon of the olive oil over the parchment. Arrange the tomato halves, cut side up, on the parchment. Drop a slice or two of garlic in each half , and pour 1 teaspoon of the olive oil into each half. It will look like a lot of olive; that’s okay. Serve warm or at room temperature. They will also keep in the fridge for about a week. This recipe is from the Fast, Fresh & Green cookbook by Susie Middleton. This recipe has been republished on this blog with permission from the author. This recipe is from the Fast, Fresh & Green cookbook, which is published by Chronicle Books. The recipe for Caramelized Plum Tomatoes in an Olive Oil Bath has been republished on this blog with permission from the author, Susie Middleton. This is not a sponsored post, however, this post does contain Amazon affiliate links. Those crostini look delicious! The caramelized tomatoes sound awesome 🙂 I imagine this is a winning appetizer! Thank you! The tomatoes really are awesome, they taste great just on their own!